BigMouth Inc SPAM Can Safe Great Hiding Place for Storing Valuables, 3" x 3" x 4.5"
Your secret is safe with us! Burglars don't have the time to rummage through everything you have. In fact, most spend an average of 6 minutes (or less) inside the home, so they will look in the most obvious places for valuables. Our decoy can safes let you hide your stash of important items in the least obvious spot. They are also available in SpaghettiOs and Campbell's Chicken Noodle Soup varieties. BigMouth Inc. is a designer and manufacturer of outrageous lifestyle products based in Glastonbury, CT. Every item we offer is exclusively designed and manufactured by us. If you are looking for the perfect gift for a friend (or yourself, don't lie), BigMouth products are always a hit. We cover a lot of ground, too-sarcastic stemware (that's fancy-pants for wine glasses), ginormous pool floats, twisted garden gnomes, hilarious mugs, manly drinking stuff, pranks-we have you covered. PERFECTLY SAFE: BigMouth's safes specialize in letting you hide important stashes in the least obvious spot: your kitchen cupboards! This unsuspecting can is made using the exact dimensions and label of a standard SPAM can. GREAT SIZE: This product is 3 x 3 x 4.5 which is true-to-size of the original product, yet still large enough to hold money, jewelry, gift cards, regular-sized wallets, and even important documents! DISCREET SECURITY: Our hidden safes are officially licensed through the authentic label, meaning this decoy item looks like an exact recreation of the original SPAM can. PERFECT STORAGE: The average thief spends 6 minutes or less inside the home, which means this exact canned food replica will go unnoticed by intruders, allowing you to hide your valuables in plain sight! THE PERFECT GIFT: This hidden storage can makes a great gift for new homeowners, college students, city dwellers, grandparents, and anyone else who needs to protect their valuables. Brand: BigMouth Inc | Manufacturer: BigMouth Inc. Whether your personal spaces are being searched or snooped through, diversion safes offer what locked safes can't: To blend in and be dismissed as an ordinary item. No thief or authority figure will think to check a stick of deodorant! *Style will be Original or Power Fresh based on availability* Whether you are at the gym, shopping, or at school have piece of mind knowing your personal items will be safe! Remove Bottom to access secret storage compartment!! 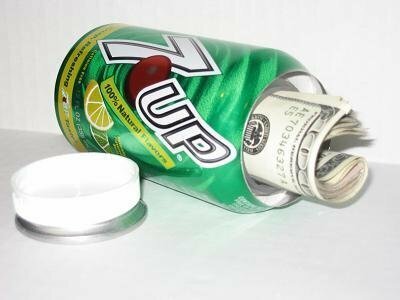 Real Deodorant on top! !,Hiding spot on the bottom. 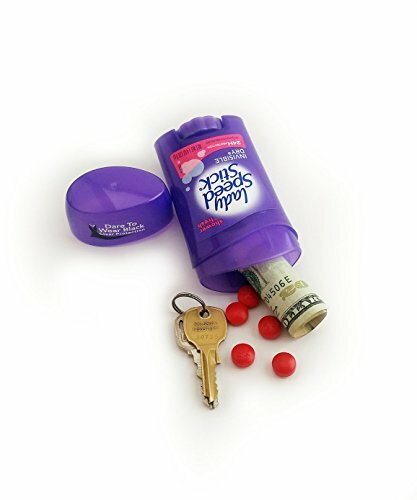 This is not a deodorant stick, but a Secret stash Diversion Safe!! BigMouth Inc Campbell's Chicken Noodle Soup Can Safe Great Hiding Place for Storing Valuables, 3" x 3" x 4.5"
Your secret is safe with us! Burglars don't have the time to rummage through everything you have. In fact, most spend an average of 6 minutes (or less) inside the home, so they will look in the most obvious places for valuables. Our decoy can safes let you hide your stash of important items in the least obvious spot. They are also available in SpaghettiOs and Spam varieties. PERFECTLY SAFE: BigMouth's safes specialize in letting you hide important stashes in the least obvious spot: your kitchen cupboards! This unsuspecting can is made using the exact dimensions and label of a standard Campbell's Chicken Noodle Soup can. DISCREET SECURITY: Our hidden safes are officially licensed through the authentic label, meaning this decoy item looks like an exact recreation of the original Campbell's Soup can. Brand: BigMouth Inc | Manufacturer: Big Mouth Inc. This diversion safe looks real because it was manufactured from a real soda can. This product offers a safe and effective way to "hide" your valuables in plain sight. Take it on vacation/business trips; leave it in a cabinet, on the shelf or in the refrigerator in your home, dorm, or office. Usable Space -Front to Back: 7/8"
The rounded deodorant portion at the top is realistic and scented. The bottom is sealed and spins realistically. Whether your personal spaces are being searched or snooped through, diversion safes offer what locked safes can't: To blend in and be dismissed as an ordinary item. 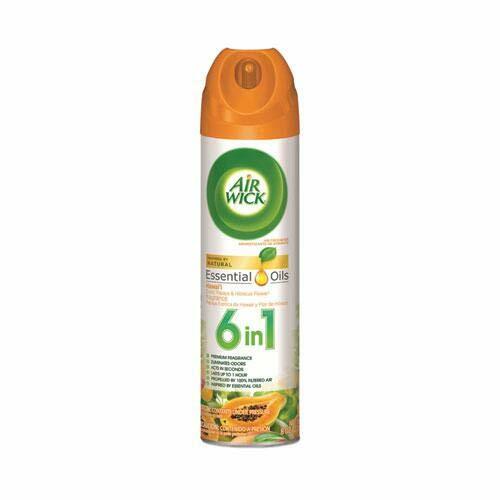 No thief or authority figure will think to check a stick of deodorant! Whether you are at the gym, shopping, or at school have piece of mind knowing your personal items will be safe! Perfect for purses, cars, luggage, gym bags and pockets! 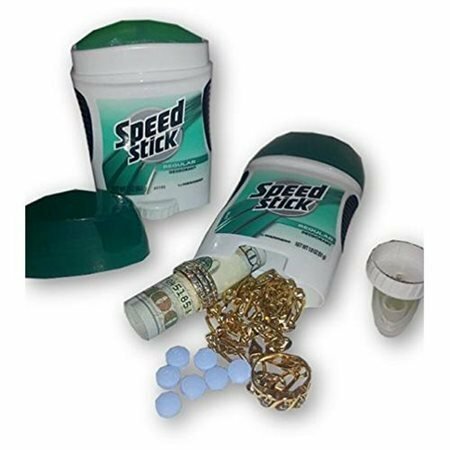 Hide your money, pills, or other valuables in plain sight! Don t settle for noisy, suspicious, smell releasing diversion safes choose PartyBottle. 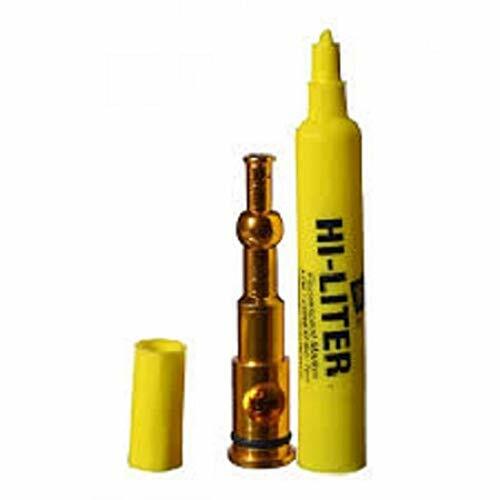 With a revolutionary invisible reverse screw system and smell-proof, sound reducing internal stash bag, you can rest assured people will think, good for you for using re-usable bottles! and suspect nothing more. Just How Much Can You Hide Away? 2.65" diameter, 3.45" deep secret compartments fits jewelry, money, a secret key, passwords, secret messages and all those other things you'd like to "stash" away. Don t let wise-nosed canines or hawk-eared bosses catch a whiff or sound of what you re hiding. Simply stash it away in this 4.5 x 3 SMELL PROOF, SOUND REDUCING internal bag before placing into your secret water bottle cavity to avoid detection, regardless of what you re carrying. Unlike easily opened top sliding models, ours actually works, with an invisible looks designer access point, and reverse screwing mechanism that keeps both bottle parts securely together, keeping your valuables safe and hidden in plain sight. PLEASE NOTE: Due to products protective nature instructions on how to open bottle safe ONLY arrive with packaging. Proof of purchase must be provided before we ll release instruction they are not published online. We re Always at the Ready to Support You! Questions? Suggestions? Need assistance? Reach out to our knowledgeable USA support team via Amazon at any time we re here to help you choose the right diversion safe stash can for your unique needs. LOOK HEALTH-CONSCIOUS, NOT SUSPICIOUS: Premium FULLY FUNCTIONAL water bottle stash container makes staying quenched while keeping your valuables safely hidden away a cinch. Perfect for travel, festivals, your car, your desk or the gym. Get even MORE VALUE when you buy more than one style diversion safes today! REVOLUTIONARY DESIGN - NOT LIKE THE OTHER STASH WATER BOTTLES: While most stash bottles hidden compartments slide away from the top, revealing their hidden cavities to anyone who bumps the bottle, our diversion safe stash bottle REVERSE SCREWS - keeping both bottle parts secure, together and INVISIBLE - so no one is the wiser. ULTRA-DURABLE, LONG-LASTING: Don't risk revealing your valuables with mini hidden safe bottles that chip, crack or degrade. We engineered our ONE OF A KIND diversion safe stash from the SAME high-quality, ultra-durable RIGID PLASTIC used by expensive name brands - so it looks like a water bottle and performs like a mini safe without the steep cost. SMELL PROOF INTERNAL STASH BAG - NO ALARMING CLUNKING SOUNDS: To ensure nosy dogs and the person who 'hears everything' doesn't ruin your secret, we've included a 4.5 x 3 SMELL PROOF, SOUND REDUCING internal stash bag that tucks neatly inside your hiding containers - so you avoid detection, regardless of what you're carrying. 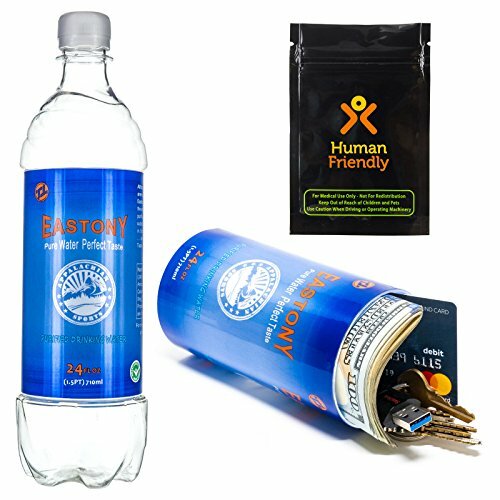 BUY WITH CONFIDENCE - 100% SATISFACTION GUARANTEE: 1000's of customers consider HumanFriendly THE TRUSTED source for premium quality diversion safe stash systems. Click add to cart and discover just how cool our PartyBottle makes keeping valuables safe during your adventures or get a full, prompt refund. Perfect disguise for clean smoking. Bowl is detachable for other stash use or cleaning. Perfect for the fridge, pantry, or anywhere you'd like! 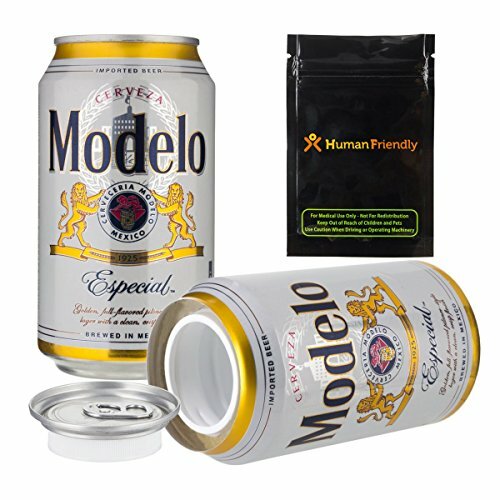 The Modelo Especial diversion safe is by far, the all-time best-selling stash can on the market. Indistinguishable from the real thing, this hidden safe is constructed from an authentic Modelo Especial aluminum can and features a top twist-off lid that reveals a hidden compartment inside. Realistic and discrete, each stash can is weighted to feel full and unopened. 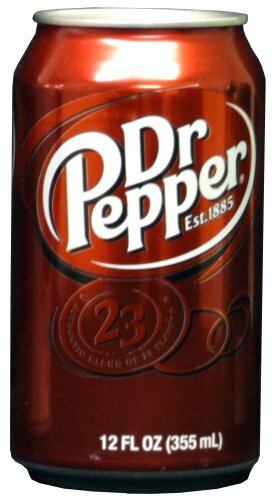 - Actual can dimensions measure approximately 4.83" high, 2.13 " wide. For added security we have included a HumanFriendly smell-proof bag (measuring 4.5" x 3") to help keep your valuables more secure. Having extra padding inside of the hidden compartment helps muffle the sound of anything moving around inside. PLEASE NOTE: While we do our best to only provide the best quality for our customers, do keep in mind the fragile nature of an empty aluminum can. 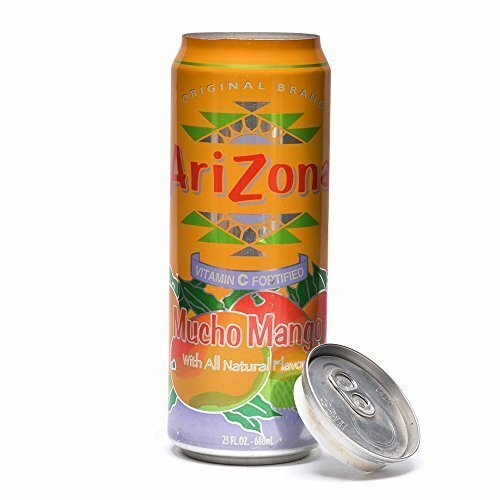 Some storage cans may have minor cosmetic imperfections, which add to the authentic nature of a real can. AUTHENTIC - Made from a real 12 fl oz Modelo Especial Beer can. You could easily place this among a dozen others in the fridge, pantry or counter and there would be no difference. WEIGHTED CAN - feels like it is full of liquid, even though there is nothing inside. HIDE YOUR VALUABLES in plain sight with this popular stash can. Having a refreshing can of beer lying around is very discrete. Nobody would suspect that your valuables could be hidden inside of it. HIDDEN COMPARTMENT is accessed by unscrewing the top aluminum lid which has the tab still intact. INCLUDES 4.5 x 3 HumanFriendly smell-proof bag to keep your valuables even more safe and secure. Having a bag inside helps to keep hard items from clunking around. 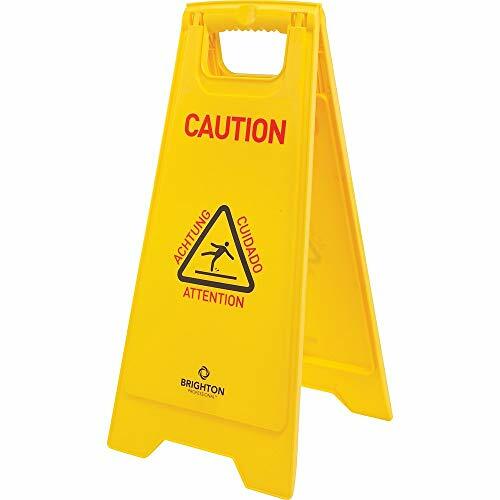 Features 3 languages: English, German and Spanish Brighton ProfessionalTM multilingual "caution" floor sign is in four languages and measures 12" x 12.5" x 24" when open and is highly visible. Type: Floor Sign. Legend: Caution. Language: Multilingual. Easy-to-see yellow. Multilingual: English, German and Spanish. Sturdy plastic construction. Size when open: 12x12-1/2x24". Caution in four languages. Type: Floor Sign. Legend: Caution. Language: Multilingual. Easy-to-see yellow. Multilingual: English, German and Spanish. Sturdy plastic construction. Size when open: 12x12-1/2x24. 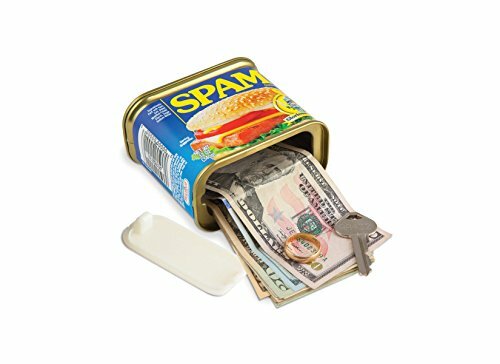 BigMouth Inc SPAM Can Safe — Great Hiding Place for Storing Valuables, 3" x 3" x 4.5"